It’s wellness queen Jennifer Aniston‘s birthday, and to celebrate I’ve been perusing her always-inspiring fitness tips. The actress has been known to be a big boxing fan, but also loves switching it up. Case in point: She even has an elliptical routine, of all things. And while I was in my black hole of Aniston-Internet searches, I stumbled upon one reason why she has such a strong core: The woman can hold a 3-minute plank. According to an interview with her trainer Leyon Azubuike in Women’s Health, Aniston can hold a two or three-minute plank “rather easily.” NBD. Meanwhile, my whole body starts trembling and I’m pouring with sweat by 30-seconds in. 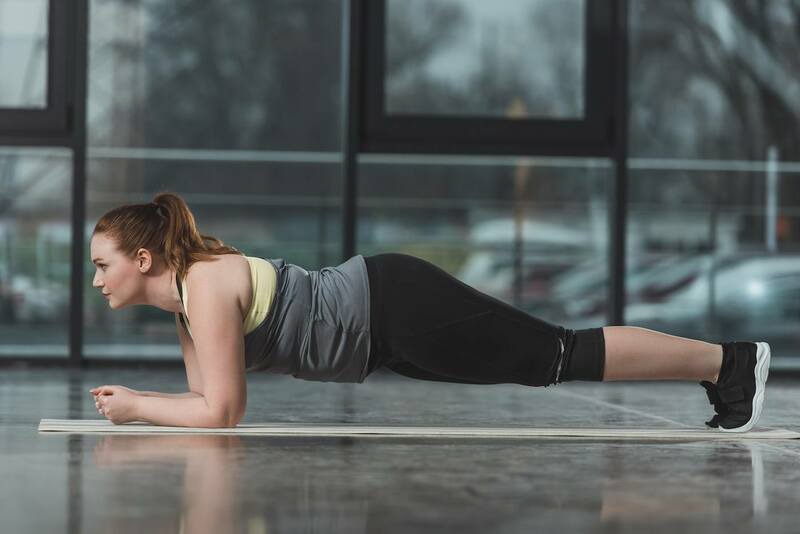 I’d love to hold a plank for longer, à la Aniston, since the ab move is one of the best ones you can do not only for your core but also your arms, your bum—the list goes on and on. “If you add time to your plank hold, it’ll turn the plank into a full-body toning exercise that’ll improve your posture and balance your strength,” says Erika Bloom, founder of Erika Bloom Pilates. The secret to doing so? It’s all about the form. Step 1: Lengthen your spine and widen your shoulder blades. “The biggest mistake people make in form is to overuse their pecs and superficial abs,” says Bloom. “Instead, recruit your deep core by lengthening your spine as you wrap your deep abs around your waist. Get out of your pecs and find proper shoulder engagement, including your rotator cuff and serratus muscles, by widening your shoulder blades and your collar bones while thinking of floating the back of your head and ribs away from the floor like you have a cloud of helium underneath you.” Juliet Kaska, a certified personal trainer and Pilates expert, adds that you should imagine your spine from your head to your tailbone as a long rod that you can’t arch or round. Step 4: Slow down your breath. Bloom notes that it’s key to slow your breath down. “Breathe deeply and fully on your inhale, and re-engage your deep core on your exhale,” she says. Then you’ll be planking for so long you’ll get bored. On a related note, here’s the proper plank form, according to Scarlett Johansson’s trainer. And these are all of the muscles that planks work.